“Breaking down barriers to build a better tomorrow” was the subject of a forum held on October 3 in Hemet, hosted by the Southwest Riverside and the Riverside Branches of the NAACP. The Democrats of Southwest Riverside County participated as a co-sponsor of the event, which included food, entertainment and music. Howard & Kathy Katz, Susan & Doug Dye and Marie McDpnald attended from the RCDP. 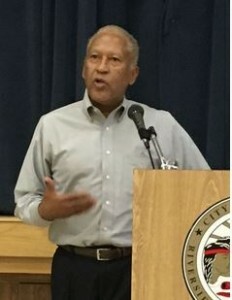 The event specifically honored Riverside County District III Supervisor, Chuck Washington, a fellow Democrat. Chuck, who previously served on the city councils and was mayor of both Murrieta and Temecula, is the first African-American on the Riverside County Board of Supervisors. He was appointed by Governor Jerry Brown earlier this year to complete the term of Jeff Stone, who had been elected to the state Senate. Chuck will be up for reelection in 2016. There were a number of speakers who spoke on the theme “Breaking Down Barriers to Build a Better Tomorrow” including several officers of the Riverside NAACP Branch, and Mark Faber, Board Pres. of NAMI (National Alliance on Mental Illness) San Jacinto, Board President Dr. Jo Anne Umezurike of NAMI Western Riverside, Dr. Shirley Johnson representing African-American Parent Advisory Council Perris Valley HighSchool District, and Pastor Beau Arbuthnot of the Adoria Ministries Center who spoke about the work being done by the African-American Parents Advisory Council to help young black youth reach goals which will enable them to live a full and satisfying life. In his keynote speech, Supervisor Washington spoke about being born in Jackson, Miss. and moving to California at a very young age. He and his sisters each summer would visit his grandparents in Mississippi so he was able to learn the “southern culture” into which his parents were born. Chuck feels very optimistic about the future of Riverside County. He feels we have the talent, the spirit, and the will to make our County the very best it can be. When he was appointed earlier this year to represent the Third District of the Riverside Board of Supervisors, he hit the road running. District 3’s population of about 440,000 stretches from Idyllwild to Anza Borrego Desert State Park, and from Temecula to San Jacinto. It includes the cities of Hemet, Murrieta, San Jacinto and Temecula, and the communities of Aguanga, Anza Valley, Cahilla.